« Can YOU Do The Cube? I remember watching the TV advert with all these kids bouncing around on their Pogo Balls and having a whale of a time, whilst I sat there nursing my scuffed knees and twisted ankles and wondering what I was doing wrong. Seems like there are some people who are actually quite skilled on these things though, as the following video clip shows. This entry is filed under Toys - Garden	and was posted on August 25th, 2008. You can follow any responses to this entry through the RSS 2.0 feed. You can leave a response, or trackback from your own site. Is this not a recipe for an instant broken leg ? @Philip: What decent child’s toy isn’t? There must be a number of toy designers out there who really have it in for children! 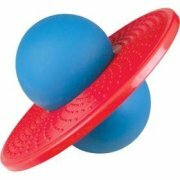 I loved my pogo ball! I would spend hours upon hours on it! I’m looking for one now! I’m looking for one too. 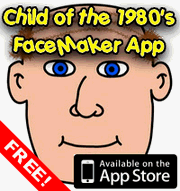 My cousin had one with a monster face on it. I think it was some sort of special edition of pogo ball. Does anyone remember the name of it?